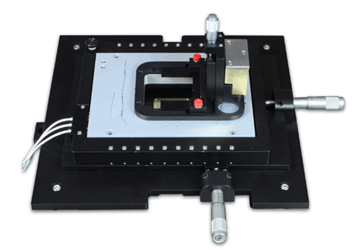 Mad City Labs' MicroMirror TIRF system is a new single molecule imaging instrument composed with high precision, high stability nanopositioning and microscopy technologies. It is designed for studying the ordered assembly and function of multi-component biomolecular machines. The MicroMirror TIRF system utilizes through-the-objective excitation and two broadband micro-mirrors positioned at the back aperture of the objective lens instead of the dichroic used in conventional TIRF systems. This results in superior signal-to-noise ratios, and simplifies the introduction of multiple spectral lines to the experiment. For more advantages of using the MicroMirror TIRF system, as well as information on its construction and imaging and control specifications, download the datasheet.